This is a hard material in which most earmold styles can be made. Default color is clear. Default finish is polished clear, a matte finish is a selected option. 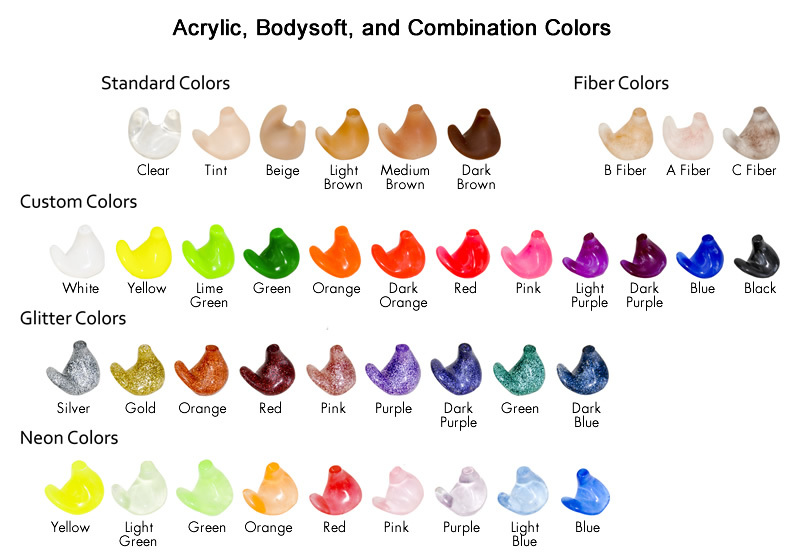 A single color as well as blood fibers, translucent tints and glitter are available. Click here for available colors. This is a soft flexible material in which most earmold styles can be made. Default color is clear. Default finish is polished, a matte finish is not available. Up to three colors can be swirled, but due to the viscosity of vinyl colors at times by bleed together. Blood fibers, translucent tints and glitter are available. Click here for available colors. This is a flexible inert rubber in which most earmold styles can be made. Default color is a beige flesh tone. Default finish is matte, due to the density of this material a polished finish is NOT available. Color selection in this material is very limited due to the density of the material. Blood fibers, translucent tints and glitter are NOT available in this material. Click here for available colors. This is a very soft and flexible inert rubber in which most earmold styles can be made. Default color is a translucent pink. Default finish is matte. a crystal clear finish is a selected option. Up to three colors can be swirled together. Blood fibers, transluscent tints and glitter are available. Click here for available colors. This material is very similiar to acrylic that softens with the body temperature. Most earmold styles can be made except for skeleton, semi-skeleton and canal w/lock styles. Default finish is matte, a polished finish is NOT available in this material. A single color as well as blood fibers, transluscent tints and glitter are available. Click here for available colors. This is a combination of a bodysoft (soft) canal and acryic (hard) concha. This material is the default selection for bodysoft skeleton, semi-skeleton and canal w/lock. Default finish is polished clear, a matte finish is a selected option. A single color as well as blood fibers, translucent tints and glitter are available. Click here for available colors. This material is available in acrylic (hard) or bodysoft (soft) and most earmold styles are made. Default finish in acrylic is a polished clear and in bodysoft a clear matte. Default color is clear. NO colors, blood fibers, transluscent tints and glitter are available. This material is used with patients that have allergic reations to other earmold materials.